Plymouth Argyle manager John Sheridan says he is happy to sacrifice playing attractive football if it means the club stay in the Football League. 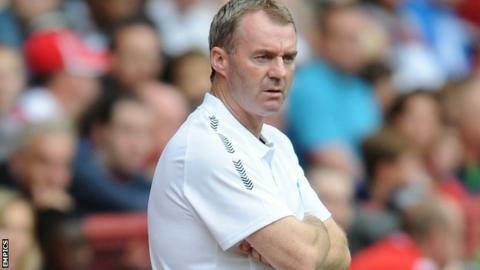 Argyle are unbeaten in Sheridan's first four games in charge and are two points off the League Two relegation zone. "I do like to play attractive football," Sheridan told BBC Devon. "But I think where we are and what's at stake, sometimes you have to sacrifice it and that's what I'll settle for if we're going to get the points." Argyle registered two goalless draws before Saturday's 2-1 win at relegation rivals Aldershot. "We seem to be getting our rewards, but everyone knows I'd like us to play better," Sheridan added. "Hopefully it'll come because I think we are improving a little bit. "We're working the best we can - we know our ball retention needs to be a lot better and we'll work on that. "I think you've got to sometimes accept that. I don't think it's time that we're going to go out and play attractive football because of where we are in the league and what's at stake."